This year marks the 32nd year of the major saltwater fishing tournament, one of the few remaining successful fishing tournaments on the eastern seaboard. Last year, the tournament attracted more than 650 competitors and 2018 promises much higher numbers as thousands of visitors are expected to stay and play in Rainbow Beach. And who wouldn’t want to enjoy our great outdoors through the day, and our friendly nightly get-togethers at the Sports Club. The weigh-ins are popular, as is the entertainment, raffles and nightly draws. Over the years, our kids have raked in some wonderful prizes – thanks to generous sponsorship the event attracts. Event organisers promise eight days of fishing, fun, entertainment and memories with an emphasis on ‘family’ and ‘community’, coming together to enjoy a fun outdoor activity. As part of the event, the Twilight Expo will run across two nights, July 21 and 22 and will showcase some of the regions best exhibitors of fishing gear, expo merchandise, bait and tackle, boating accessories and outdoor gear. The Fishing Classic has four major classes of fishing, ‘Beach’, ‘Reef’, ‘Jew’ and ‘Big Fish’. 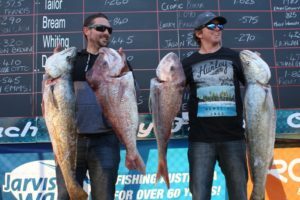 These classes provide offshore, inshore and beach fishing and cater for all levels of fishing experience. Major prizes are awarded based on participation rather than competitive spirit.